Congenital diaphragmatic hernia (see the image below) is characterized by a variable degree of pulmonary hypoplasia associated with a decrease in cross-sectional area of the pulmonary vasculature and alterations of the surfactant system. There are 3 basic types of congenital diaphragmatic hernia: the posterolateral Bochdalek hernia (occurring at approximately 6 weeks' gestation), the anterior Morgagni hernia, and the hiatus hernia. 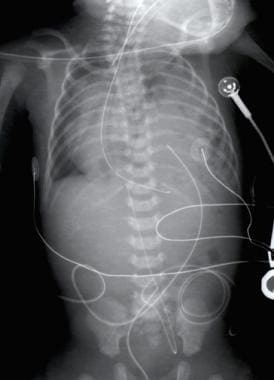 Radiograph of a 1-day-old infant with a moderate-sized congenital diaphragmatic hernia (CDH). Note the air- and fluid-filled bowel loops in the left chest, the moderate shift of the mediastinum into the right chest, and the position of the orogastric tube. Infants with congenital diaphragmatic hernias most commonly present with respiratory distress and cyanosis in the first minutes or hours of life, although a later presentation is possible. The respiratory distress can be severe and may be associated with circulatory insufficiency, requiring aggressive resuscitative measures. Continuous pulse oximetry is valuable in the diagnosis and management of persistent pulmonary hypertension of the newborn. The ideal time to repair a congenital diaphragmatic hernia is unknown. Some authors suggest that repair 24 hours after stabilization is ideal, but delays of up to 7-10 days are typically well tolerated, and many surgeons now adopt this approach. Other surgeons prefer to operate on these neonates when normal pulmonary artery pressure is maintained for at least 24-48 hours based on echocardiography. The topic of congenital diaphragmatic hernia (CDH) has frequently appeared in the medical literature since its first description in the early 18th century. Initial theories about the pathophysiology of this condition centered on the presence of the herniated viscera within the chest and the need for its prompt removal. Over the past 20 years, pulmonary hypertension and pulmonary hypoplasia have been recognized as the 2 cornerstones of the pathophysiology of congenital diaphragmatic hernia. In recent years, evidence suggests that cardiac maldevelopment may further complicate the pathophysiology of congenital diaphragmatic hernia. See the image below. Congenital diaphragmatic hernia is characterized by a variable degree of pulmonary hypoplasia associated with a decrease in cross-sectional area of the pulmonary vasculature and alterations of the surfactant system. The lungs have a small alveolar capillary membrane for gas exchange, which may be further decreased by surfactant dysfunction. In addition to parenchymal disease, increased muscularization of the intraacinar pulmonary arteries appears to occur. In very severe cases, left ventricular hypoplasia is observed. Pulmonary capillary blood flow is decreased because of the small cross-sectional area of the pulmonary vascular bed, and flow may be further decreased by abnormal pulmonary vasoconstriction. Congenital diaphragmatic hernia occurs in 1 of every 2000-3000 live births and accounts for 8% of all major congenital anomalies. The risk of recurrence of isolated (ie, nonsyndromic) congenital diaphragmatic hernia in future siblings is approximately 2%. Familial congenital diaphragmatic hernia is rare (< 2% of all cases), and both autosomal recessive and autosomal dominant patterns of inheritance have been reported. Congenital diaphragmatic hernia is a recognized finding in Cornelia de Lange syndrome and also occurs as a prominent feature of Fryns syndrome, an autosomal recessive disorder with variable features, including diaphragmatic hernia, cleft lip or palate, and distal digital hypoplasia. Mortality has traditionally been difficult to determine. This is partially because of the "hidden mortality" for this condition, which refers to infants with congenital diaphragmatic hernia who die in utero or shortly after birth, prior to transfer to a surgical site. This bias may be especially important when evaluating institutional reports of outcome. A population-based study from Western Australia indicated that only 61% of infants with congenital diaphragmatic hernia are live born. In that study, nearly 33% of pregnancies that involved a fetus with congenital diaphragmatic hernia were electively terminated. Most of the pregnancies (71%) were terminated because of the presence of another major anomaly. Mortality after live birth is generally reported to range from 40-62%, and some authors argue that the true mortality of congenital diaphragmatic hernia has not changed with introduction of new therapies. The presence of associated anomalies has consistently been associated with decreased survival; other associations with poor outcome include prenatal diagnosis, prematurity, low birth weight, and early pneumothorax. Keller et al found that infants with congenital diaphragmatic hernia who have poor outcomes (death or discharge on oxygen) have higher plasma levels of endothelin-1, which is dysregulated in pulmonary hypertension. Severity of pulmonary hypertension was also associated with increasing endothelin-1 levels. Most studies report that congenital diaphragmatic hernia occurs equally in males and females. Although congenital diaphragmatic hernia is usually a disorder of the newborn period, as many as 10% of patients may present after the newborn period and even during adulthood. Outcome in patients with late presentation of congenital diaphragmatic hernia is extremely good, with low or no mortality. Vijfhuize S, Schaible T, Kraemer U, Cohen-Overbeek TE, Tibboel D, Reiss I. Management of pulmonary hypertension in neonates with congenital diaphragmatic hernia. Eur J Pediatr Surg. 2012 Oct. 22(5):374-83. [Medline]. Harrison MR, Keller RL, Hawgood SB, et al. A randomized trial of fetal endoscopic tracheal occlusion for severe fetal congenital diaphragmatic hernia. N Engl J Med. 2003 Nov 13. 349(20):1916-24. [Medline]. Jelin E, Lee H. Tracheal occlusion for fetal congenital diaphragmatic hernia: the US experience. Clin Perinatol. 2009 Jun. 36(2):349-61, ix. [Medline]. Gross RE. Congenital hernia of the diaphragm. Am J Dis Child. 1946. 71:579-592. Areechon W, Reid L. Hypoplasia of the lung associated with congenital diaphragmatic hernia. Br Med J. 1963. i:230-3. Klaassens M, de Klein A, Tibboel D. The etiology of congenital diaphragmatic hernia: still largely unknown?. Eur J Med Genet. 2009 Sep-Oct. 52(5):281-6. [Medline]. Jandus P, Savioz D, Purek L, Frey JG, Schnyder JM, Tschopp JM. [Bochdalek hernia: a rare cause of dyspnea and abdominal pain in adults]. Rev Med Suisse. 2009 May 13. 5(203):1061-4. [Medline]. Fisher JC, Haley MJ, Ruiz-Elizalde A, Stolar CJ, Arkovitz MS. Multivariate model for predicting recurrence in congenital diaphragmatic hernia. J Pediatr Surg. 2009 Jun. 44(6):1173-9; discussion 1179-80. [Medline]. Keller RL, Tacy TA, Hendricks-Munoz K, et al. Congenital diaphragmatic hernia: endothelin-1, pulmonary hypertension, and disease severity. Am J Respir Crit Care Med. 2010 Aug 15. 182(4):555-61. [Medline]. [Full Text]. Sluiter I, Veenma D, van Loenhout R, Rottier R, de Klein A, Keijzer R, et al. Etiological and pathogenic factors in congenital diaphragmatic hernia. Eur J Pediatr Surg. 2012 Oct. 22(5):345-54. [Medline]. Clugston RD, Zhang W, Alvarez S, De Lera AR, Greer JJ. Understanding Abnormal Retinoid Signaling as a Causative Mechanism in Congenital Diaphragmatic Hernia. Am J Respir Cell Mol Biol. 2009 May 15. [Medline]. Mitanchez D. [Neonatal prognosis of congenital diaphragmatic hernia]. Arch Pediatr. 2009 Jun. 16(6):888-90. [Medline]. Keller RL. Antenatal and postnatal lung and vascular anatomic and functional studies in congenital diaphragmatic hernia: implications for clinical management. Am J Med Genet C Semin Med Genet. 2007 May 15. 145C(2):184-200. [Medline]. Bryner BS, West BT, Hirschl RB, et al. Congenital diaphragmatic hernia requiring extracorporeal membrane oxygenation: does timing of repair matter?. J Pediatr Surg. 2009 Jun. 44(6):1165-71; discussion 1171-2. [Medline]. Deprest JA, Gratacos E, Nicolaides K, et al. Changing perspectives on the perinatal management of isolated congenital diaphragmatic hernia in Europe. Clin Perinatol. 2009 Jun. 36(2):329-47, ix. [Medline]. Fliman PJ, deRegnier RA, Kinsella JP, Reynolds M, Rankin LL, Steinhorn RH. Neonatal extracorporeal life support: impact of new therapies on survival. J Pediatr. 2006 May. 148(5):595-9. [Medline]. Gentili A, Giuntoli L, Bacchi Reggiani ML, Masciopinto F, Lima M, Baroncini S. Neonatal congenital diaphragmatic hernia: respiratory and blood-gas derived indices in choosing surgical timing. Minerva Anestesiol. 2012 Oct. 78(10):1117-25. [Medline]. Peetsold M, Huisman J, Hofman VE, Heij HA, Raat H, Gemke RJ. Psychological outcome and quality of life in children born with congenital diaphragmatic hernia. Arch Dis Child. 2009 Jun 15. [Medline]. Albanese CT, Lopoo J, Goldstein RB, et al. Fetal liver position and perinatal outcome for congenital diaphragmatic hernia. Prenat Diagn. 1998 Nov. 18(11):1138-42. [Medline]. Bohn DJ, Pearl R, Irish MS, Glick PL. Postnatal management of congenital diaphragmatic hernia. Clin Perinatol. 1996 Dec. 23(4):843-72. [Medline]. Colvin J, Bower C, Dickinson JE, Sokol J. Outcomes of congenital diaphragmatic hernia: a population-based study in Western Australia. Pediatrics. 2005 Sep. 116(3):e356-63. [Medline]. [Full Text]. Cortes RA, Keller RL, Townsend T, et al. Survival of severe congenital diaphragmatic hernia has morbid consequences. J Pediatr Surg. 2005 Jan. 40(1):36-45; discussion 45-6. [Medline]. Finer NN, Tierney A, Etches PC, Peliowski A, Ainsworth W. Congenital diaphragmatic hernia: developing a protocolized approach. J Pediatr Surg. 1998 Sep. 33(9):1331-7. [Medline]. Garred P, Madsen HO, Balslev U, et al. Susceptibility to HIV infection and progression of AIDS in relation to variant alleles of mannose-binding lectin. Lancet. 1997 Jan 25. 349(9047):236-40. [Medline]. Kapur P, Holm BA, Irish MS, Patel A, Glick PL. Tracheal ligation and mechanical ventilation do not improve the antioxidant enzyme status in the lamb model of congenital diaphragmatic hernia. J Pediatr Surg. 1999 Feb. 34(2):270-2. [Medline]. Kays DW, Langham MR Jr, Ledbetter DJ, Talbert JL. Detrimental effects of standard medical therapy in congenital diaphragmatic hernia. Ann Surg. 1999 Sep. 230(3):340-8; discussion 348-51. [Medline]. [Full Text]. Kehl S, Becker L, Eckert S, Weiss C, Schaible T, Neff KW, et al. Prediction of mortality and the need for neonatal extracorporeal membrane oxygenation therapy by 3-dimensional sonography and magnetic resonance imaging in fetuses with congenital diaphragmatic hernias. J Ultrasound Med. 2013 Jun. 32(6):981-8. [Medline]. Kinsella JP, Parker TA, Ivy DD, Abman SH. Noninvasive delivery of inhaled nitric oxide therapy for late pulmonary hypertension in newborn infants with congenital diaphragmatic hernia. J Pediatr. 2003 Apr. 142(4):397-401. [Medline]. Lally KP. Extracorporeal membrane oxygenation in patients with congenital diaphragmatic hernia. Semin Pediatr Surg. 1996 Nov. 5(4):249-55. [Medline]. Lally KP, Breaux CW Jr. A second course of extracorporeal membrane oxygenation in the neonate--is there a benefit?. Surgery. 1995 Feb. 117(2):175-8. [Medline]. Lally KP, Lally PA, Langham MR, et al. Surfactant does not improve survival rate in preterm infants with congenital diaphragmatic hernia. J Pediatr Surg. 2004 Jun. 39(6):829-33. [Medline]. Langham MR Jr, Kays DW, Ledbetter DJ, Frentzen B, Sanford LL, Richards DS. Congenital diaphragmatic hernia. Epidemiology and outcome. Clin Perinatol. 1996 Dec. 23(4):671-88. [Medline]. [Guideline] Maisch B, Seferovic PM, Ristic AD, et al. Guidelines on the diagnosis and management of pericardial diseases. European Society of Cardiology. 2004. NINOS. Inhaled nitric oxide and hypoxic respiratory failure in infants with congenital diaphragmatic hernia. The Neonatal Inhaled Nitric Oxide Study Group (NINOS). Pediatrics. 1997 Jun. 99(6):838-45. [Medline]. [Full Text]. Nobuhara KK, Lund DP, Mitchell J, Kharasch V, Wilson JM. Long-term outlook for survivors of congenital diaphragmatic hernia. Clin Perinatol. 1996 Dec. 23(4):873-87. [Medline]. Nobuhara KK, Wilson JM. Pathophysiology of congenital diaphragmatic hernia. Semin Pediatr Surg. 1996 Nov. 5(4):234-42. [Medline]. O'Toole SJ, Irish MS, Holm BA, Glick PL. Pulmonary vascular abnormalities in congenital diaphragmatic hernia. Clin Perinatol. 1996 Dec. 23(4):781-94. [Medline]. Reickert CA, Hirschl RB, Atkinson JB, et al. Congenital diaphragmatic hernia survival and use of extracorporeal life support at selected level III nurseries with multimodality support. Surgery. 1998 Mar. 123(3):305-10. [Medline]. Slavotinek AM. The genetics of congenital diaphragmatic hernia. Semin Perinatol. 2005 Apr. 29(2):77-85. [Medline]. Stege G, Fenton A, Jaffray B. Nihilism in the 1990s: the true mortality of congenital diaphragmatic hernia. Pediatrics. 2003 Sep. 112(3 Pt 1):532-5. [Medline]. [Full Text]. Steinhorn RH, Kriesmer PJ, Green TP, McKay CJ, Payne NR. Congenital diaphragmatic hernia in Minnesota. Impact of antenatal diagnosis on survival. Arch Pediatr Adolesc Med. 1994 Jun. 148(6):626-31. [Medline]. Stolar CJ. What do survivors of congenital diaphragmatic hernia look like when they grow up?. Semin Pediatr Surg. 1996 Nov. 5(4):275-9. [Medline]. Van Meurs K. Is surfactant therapy beneficial in the treatment of the term newborn infant with congenital diaphragmatic hernia?. J Pediatr. 2004 Sep. 145(3):312-6. [Medline]. Weinstein S, Stolar CJ. Newborn surgical emergencies. Congenital diaphragmatic hernia and extracorporeal membrane oxygenation. Pediatr Clin North Am. 1993 Dec. 40(6):1315-33. [Medline]. Wilcox DT, Irish MS, Holm BA, Glick PL. Pulmonary parenchymal abnormalities in congenital diaphragmatic hernia. Clin Perinatol. 1996 Dec. 23(4):771-9. [Medline]. Wilson JM, Lund DP, Lillehei CW, Vacanti JP. Congenital diaphragmatic hernia--a tale of two cities: the Boston experience. J Pediatr Surg. 1997 Mar. 32(3):401-5. [Medline]. Disclosure: Received consulting fee for participating in a clinical study steering committee. for: United Therapeutics.